Simon Cooksley from Canada loves ShopWildThings! 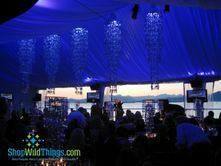 In this photo, our huge "Stunner" Chandeliers hang above. The tabletops feature our "Delight" chandeliers in silver. He used our chandelier as a centerpiece. BEAUTIFUL!